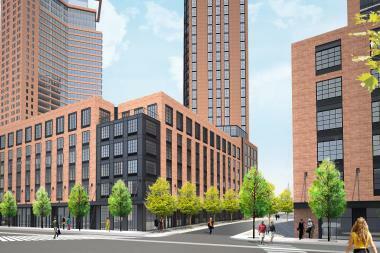 Developers have gotten the green light to begin Greenpoint Landing. GREENPOINT — Two massive, controversial development projects in North Brooklyn that won City Council approval this week surprised and delighted locals with additional affordable housing provisions — the most crucial need in the quickly gentrifying area, residents said. The two projects — a 20-acre, 10-tower "mini-neighborhood" on the Greenpoint waterfront and the complete rezoning of several Bushwick blocks for apartments and retail at the former Rheingold Brewery site — got the green light from the City Council on Wednesday after locals' vociferous opposition to the plans. But Bushwick's revised rezoning plan offered 50 percent more affordable housing than in its initial proposal, which now means that 30 percent of the 977 apartments will be for affordable housing. Developers also granted seven of their lots on the site to two local nonprofits to build senior-specific affordable housing, local advocate Rob Solano said. "No one thought these guys were going to commit to senior housing. This is a huge deal," said Solano, executive director of Churches United for Fair Housing, which is working with the nonprofit Los Sures to build 86 units for seniors on the newly granted 74,000-square-feet of buildable space at the lots, he said. "They sold us the lots for one dollar." Rheingold's developer, Read Property Group, also pledged $250,000 total over two years to an anti-displacement fund that would help residents who were booted from their homes or had legal trouble with their landlords as rents rose in Bushwick, Solano said. "This is the first time there's anti-displacement money in Bushwick," Solano said, noting that the city had provided such funds in Greenpoint and Williamsburg with the 2005 rezoning but that the money had all been used. The Greenpoint developer, Greenpoint Landing Associates, also committed to include senior-specific housing in its buildings if it successfully secured government funding, such as money provided by the U.S. Department of Housing and Urban Development's Supportive Housing for the Elderly Program, Councilman Stephen Levin's office said. Previously, the developer had made no pledge to include senior-specific affordable housing in its project. The city also agreed to reinstate $500,000 to an anti-displacement housing fund, Levin's office said. Other significant revisions in the Bushwick project included Read Property's pledge of $360,000 to neighboring elementary schools P.S. 120 and P.S. 145, for computer lab upgrades and urban gardening initiatives, a representative from Councilwoman Diana Reyna's office said. The developer also promised to hire local workers for the project's construction and maintenance, Reyna's representative added. "This rezoning, thanks to the ongoing collaboration of Read Property Group and community stakeholders, is a terrific example of development that is fair and accountable to the people," said Reyna, who has led an advisory panel of community leaders in talks with Read. Meanwhile, Greenpoint Landing's developers also pledged an additional $3 million to help fund the neighboring Newtown Barge Park — bringing the park's total budget to $10 million, Levin said. "After long and detailed discussions with the developer, Greenpoint will finally be getting the open space and affordable housing that it deserves,” the councilman added. Although many residents have actively fought the project, the developer already had the right to build the towers, according to the city's 2005 rezoning provisions. The City Council's approval vote Wednesday was for developers to purchase land adjacent to their property from the city at Dupont and Commercial streets. "We thank Levin and the City Council for their decision," said a spokeswoman for Greenpoint Landing Associates, noting that 431 units of affordable housing would be built on their new land, as is required by the city. A representative for Read Property Group did not immediately respond to requests for comment.